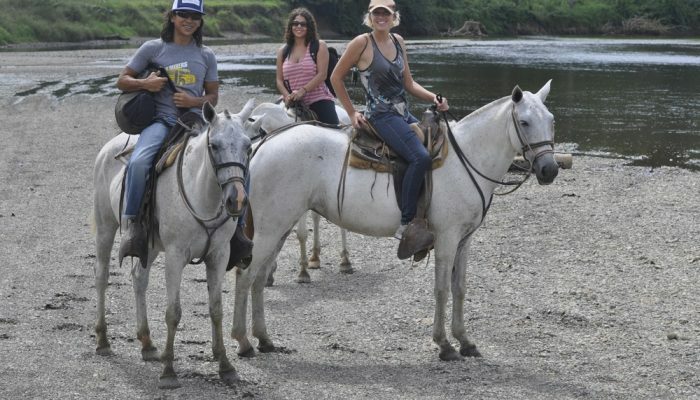 If you love horses and sunsets, then Santa Teresa, Costa Rica is the place for you. 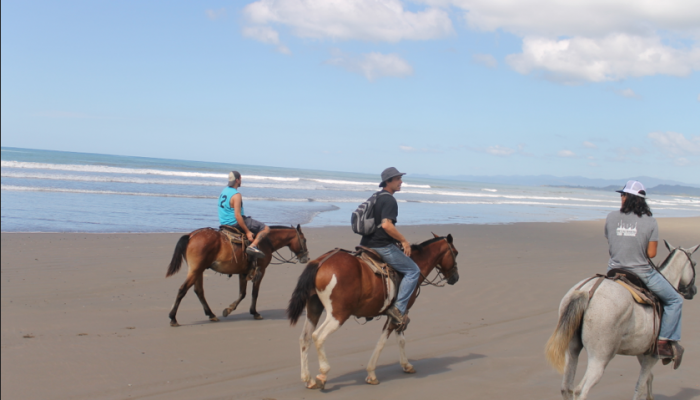 On any given day here, you can see families and couples enjoying a peaceful horseback ride on the beach. It is like a scene out of a romantic movie or one of those Caribbean holiday commercials that you used to see growing up. The horseback riders are smiling from ear to ear as their beautiful horses trot down the beach and even into the ocean. If this sounds like something that you would like to do while you are in Santa Teresa, please speak to a receptionist at the Blue Surf Sanctuary Hotel in Santa Teresa when you check-in. The best place to ride a horse on the beach at sunset is in Manzanillo, a pristine beach about 20-minutes north of Santa Teresa. 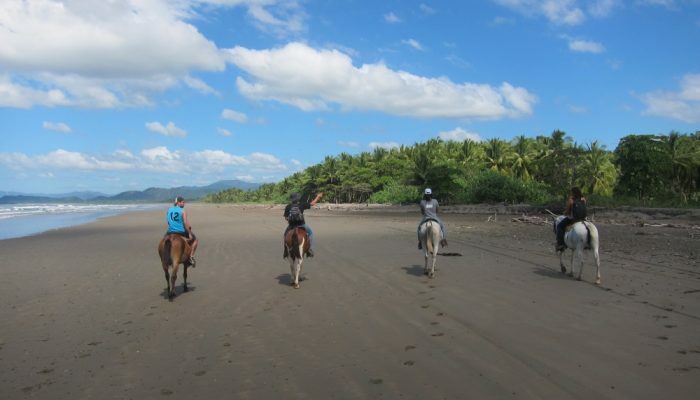 This is a beautiful, long stretch of beach that is virtually unspoiled and perfect for horseback riding. A bilingual guide will accompany you and take you on a 2.5-hour horseback riding tour of Manzanillo and the surrounding beaches. This tour costs $65 per person. 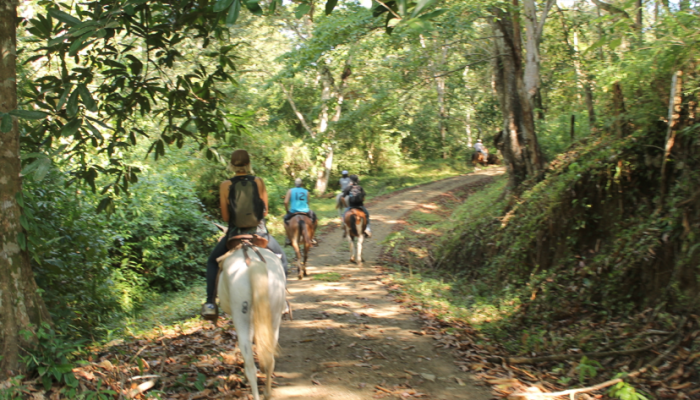 Another great horseback riding tour that you can do while you are in Santa Teresa is a horseback riding tour on the 5000 acre of Hacienda Ario. Hacienda Ario is a family owned cattle ranch that prides itself on conservation and sustainability. This horseback riding is great for both experienced horseback riders as well as for those whose first time it is on a horseback. 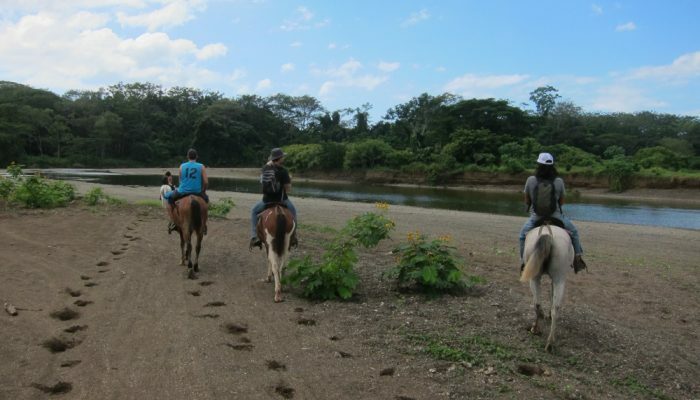 It is an eco-horseback riding tour where you will enjoy amazing views, discover untouched beaches and ride through open pastures. At the same time, you will also learn all about Costa Rica’s wild ecosystems, its cattle traditions and its unique wildlife and ecosystems. Expect to see a lot of exotic birds on this tour while horseback riding through open fields, rivers and along side the ocean. This unique horseback riding tour is 2.5-hours and it is $85 per person. If you have your own transportation to the Hacienda Ario or you are a group of 3 or more, ask about the discounted rate. This tour leaves the Hacienda Ario every day at 8:30am and 2:30pm. 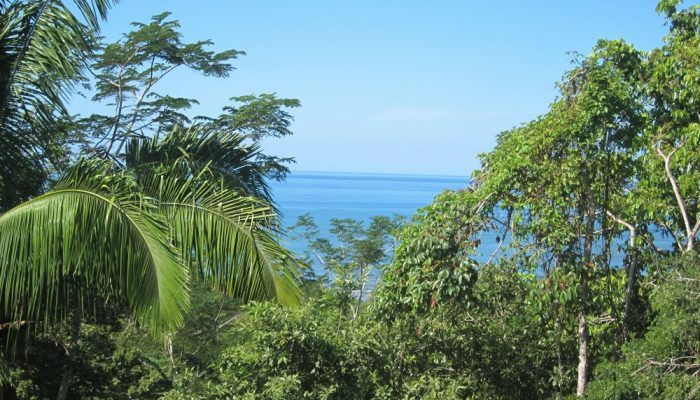 It includes a Costa Rican Naturalist Tour Guide, a local Cowboy guide from the Hacienda Ario, your entrance fee to the Hacienda Arío and Insurance coverage by INS. 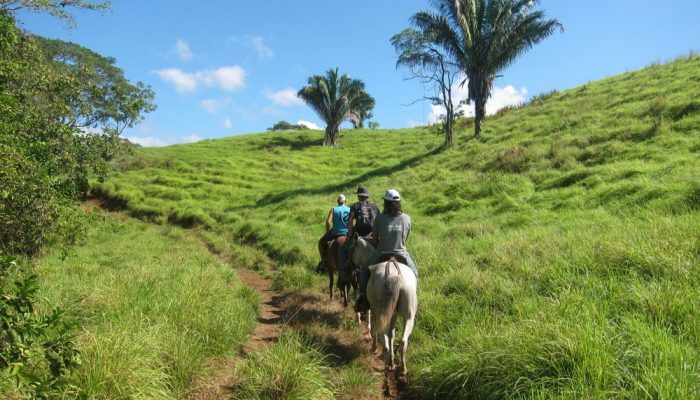 Whichever horseback riding in Costa Rica tour you choose, it is important that you remember to bring water, long pants, shoes, insect repellent, sunscreen and a hat. I have been horseback riding many times in my life but horseback riding near Santa Teresa was one of the best experiences I have had by far. The guide picked us up in the afternoon from the hotel and drove us about 35 minutes out of town. As we were driving I could have sworn the tour guides car was a time machine. I felt as if we had traveled back in time to what Costa Rica must have been like 20 years ago. As we drove down the rocky dirt path we saw simple wooden Costa Rican homes with thatched roofs sprinkled along the mountainside and beautifully carved signs that hung gracefully off of the coconut palms. The road was decorated with large unusual green pachote trees that looked as if you leaned upon it, it would prick you a thousands time. After a 35 minute bumpy ride through the wilderness we had finally arrived to a large property where our horses were awaiting us. The guide introduced us to the horses we would be riding and made us feel at ease. We mounted our horses and set off for an eventful afternoon. As the sun kissed our faces we galloped towards the grassy hilltops where were were able to see the entire peninsula. The view was impeccable and clear. The clouds looked like large white pillows in the sky. Honestly I wish we could have floated on them. As we gazed out into the horizon the guide explained the history of the area, the agriculture found on the land we were visiting and the type of wildlife that normally lives in the area. After admiring the breathtaking view we headed towards the creek were our horses stopped for a water break. Near the creek we saw rare birds that disguised themselves while resting in the trees and radiant flowers. It became clear to me that this area is a bird watchers paradise. after trotting around the creek, we headed towards the beach. As the sun started to set we galloped along the unspoiled and untouched coast line. We were the only people on the beach and felt as if we were a million miles away from civilization. Everything felt so organic. This is the side of Costa Rica everyone should try to see while they are visiting. There are rare times in our daily lives where we can see such things. So take an afternoon off and disconnect from the world for a few hours and see something beautiful. You won’t regret it. I suggest bringing a few snacks, water and sunblock. be sure to wear pants and bring a camera.